Happy Thursday! We are almost to the weekend! As a mom, there’s just never a good time to wear white nor should you ever think you’ll make it through the day without a mark. Yet, here I am all in white everything to make a point about fashion and healing. When I found myself on the deep end of grief, I couldn’t bear to think about color or anything bright in my wardrobe. I loved all things dark. I hid in the clothes (and the fact that it was winter helped!) and my black wardrobe took over. When I think back to working in the corporate world in New York City, wearing black was a uniform. You wore a black pencil skirt, blazer, and had a black handbag and shades which meant you were serious and meant business. You wore it like armor. But I’m here to tell you that wearing white and color is my new strength. I wear white to say Here I Am. I am bright and shiny and living. When you are going through the depths of darkness, just know you’ve still got the light to get you out! And as a mother, don’t be afraid to wear white (Save the pizza for another day!). Wear white as your armor, wear it as your statement piece, wear it to get out of the dark and move yourself from one season of your life to another. Love! 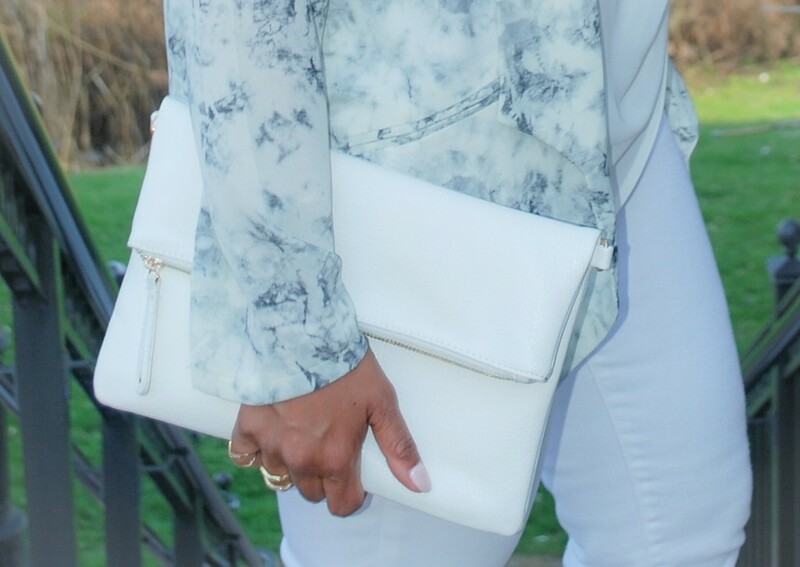 I rarely wear white, but this is inspiring me! Love this message. I love the bag with the jacket. So pretty together.